This activity is a 2-hour guided hike (with plenty of breaks) through giant douglas fir and cedar trees, ferns, and on clear days beautiful views of Mt. Hood and Mt. St. Helens. Distance & Difficulty - The total distance is 3-4 miles and is rated as "moderate" with some hills and switchbacks. About Forest Park - Forest Park is one of the largest urban parks in the world and the only city wilderness park in the United States. The park is home to hundreds of native plants and animals and offers more than eighty miles of trails - all within minutes of downtown Portland. While navigating the park on your own can be daunting, Sarah will ensure that you have an enjoyable experience and do not get lost! If you want to hike or walk slowly that is absolutely OK! If you want to have a rigorous fitness hike that is OK, too. Photography stops and nature gazing are welcome! 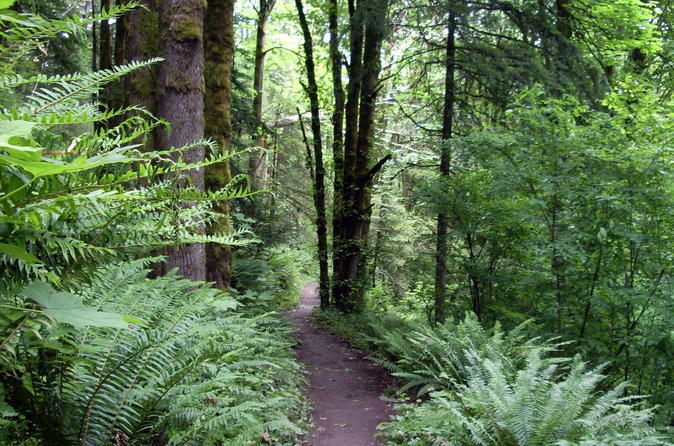 Enjoy a guided hike in one of Portland's crown jewels - Forest Park - with a naturalist who will explain the names of the different trees and plants, and information about the history of the area (native Americans, Lewis & Clark, Oregon Trail, etc.). About Forest Park: Forest Park is one of the country's largest urban forest reserves. The park covers more than 5,000 acres of forest with a few patches of old growth. More than 112 bird species and 62 mammal species frequent the park and its wide variety of trees and shade-loving plants. Many small creeks run through the woods. It is an ideal place to experience the big woods of the Pacific Northwest without leaving Portland. Our hike route is approximately 2.5-4 miles. It can be longer or shorter if you prefer - that is entirely up to you and how you are feeling the day of the hike.